Getting dressed - how we do it! Shorts and shirts are standard in our house. Dresses would (I imagine) be a little more difficult. Here is one of the earliest photographs I have of Otis in his care of self - dressing area when he was 13-17 months. The cube chair and sitting has really helped with this process which can begin once they can sit. I'm not going to pretend that you need help with this. I'm sure everyone knows how to dress their own child. I've actually been told numerous times that helping a child to dress while being behind them is helpful, that way you can place your hands where their hands need to be. It's always made sense to me for Otis to be sitting and it's best with his chair against the wall, so this is how we do it. Otis likes to do most of it himself now and as the child gets older they will need your help less. Underpants and really all pants can be placed on the floor to start with. When Otis was younger he would stand in the holes, put each foot in each hole - then pull up his pants. Now he is older he will put one foot in one hole, pull up a little then put the next foot in the next hole and pull up. Shirts can be placed on the floor in front of them or in their laps, Otis can sometimes get this far himself but often has his shirt on back to front. The tag goes at the back Otis. Teaching him to hold his shirt like this has meant he gets his head through easier. Not easy but easier. It doesn't always work. Then he needs to find the arm holes. If this happens I hold/stretch the arm of the shirt out and he can put his arm back in and find the arm hole himself. I don't push him, if he starts to get frustrated I will increase my level of help. Other arm easy, pull down the shirt and he is ready! Loose clothing is easier than tight fitting. Younger children can start slowly, by stepping into or putting their feet through the pant leg holes and the parent can pull up the pants. Consistency helps, having your child participate in dressing everyday is best rather than some days you do it and other days you expect them to. Set them up for success with easy clothing. Full them with confidence, don't embarrass or dismiss them for their efforts. Self dressing is a little like toilet learning, I believe the earlier they can do it themselves the better but it's time consuming and takes patience. At our (Montessori) parent toddler group I've been privileged to witness children much younger than Otis cut, slice, spread and grate. Capable, young (I think the youngest is 18 months) children. With parents willing to take inspiration and guidance from our teacher. Otis has never hurt himself grating or peeling. But it doesn't happen in any haphazard way. Clearly demonstrated. Closely supervised. Often working side by side. We've tried a lot of peelers over the years and I've always found the horizontal peelers work best for children. Otis first started grating and peeling carrots (for Caspar's school lunch) however I believe the easiest way to start grating is with cheese or even soft soap. With peeling it's easiest with cucumber or zucchini, where the peel is thicker (than carrot for example) and clearly visible. And it's even better if the grating and peeling has purpose. Grating soap for making soap balls or hand washing. Grating carrot for sandwiches. Or peeling cucumber for snack! Shop Update. Inspire them and set their imaginations free. This week I really began to notice that many of my work practices have become permanent features in my life. It's taken time but I finally feel like a real business person. Quite the transformation! It's also really nice to start to feel professional again. I'm still struggling to keep many items in stock. This is a combination of new items selling out quickly and finding a rhythm with my suppliers. I hope by the new year I can manage to keep our stock levels high although many of our handmade items will come in limited supply. This week back in stock we have Cookie Stamps (available in leaf, bear, flower, Cupid, hearts, sun, moon and star), Small and Medium Pitchers, Kids' Mini Choppers, First Graters (now available in all four colours). and Mini Trays. We have many more of our kitchen items arriving back in stock soon. We also anticipate receiving the first of our infant materials this week. 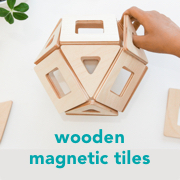 The best way to stay in touch with new arrivals, sometimes they sell out before I get to mention them here, is to connect with the How we Montessori Shop on Facebook page. Yes, I've set up a separate Facebook page just for the shop. I will post new arrivals, items back in stock and all updates here (please stop by, I'm currently on zero likes!). Finally for some exciting news. While it's not a Montessori material specifically it is a really inspiring at home material. We have Texo new in stock and my children are loving the addition of these 'construction' toys to our block area. For Caspar in particular they are providing an engineering challenge. As a child who has played endlessly with blocks, sticks and found materials he is enjoying taking his construction to a new level. Texo would make a great gift for birthdays or Christmas, recommended for ages 3-8 years, you can read my full description here. Also available on Amazon (this is an affiliate link) here. This week I have also changed our International Shipping Policy. Small packages will ship international at $14.95. For medium and large packages please email me your address (postcode required) and a list of the items you would like to order. I will email you back with a shipping quote and a Paypal invoice. Shipping international has so many variables this is the most accurate way to determine shipping costs. Also I'm happy to put items aside if some of the items you are wanting are not in stock. Just email! howwemontessori@gmail.com. Thank you also for the emails on ideas and suggestions for new items. I have found some lovely things and will work to stock many of your suggestions. 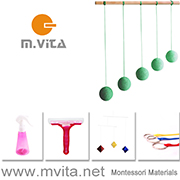 If you or someone you know makes Montessori materials and feel you would like to supply our shop please email me also. Have a fun week! Any book with Montessori in the title is going to catch my attention. More so if it's a children's book. More so if it's a new release. Of course I had to read this one and I'm so glad I did! Jack Goes to Montessori School was written by a Montessori Mom (Allyson Collins) and illustrated by a Montessori teacher (Lindsey R. Smith) - both in Texas, to help other parents and students learn what makes the Montessori experience special. As someone who already understands Montessori and with children at Montessori, this book conjures up feelings of being part of a special community. No matter where we live if our children attend Montessori they learn the same way. In Austin or Canberra it's Movable Alphabets, Puzzle Maps, Pink Towers and Number Rods all the way. The book is written through the eyes of a young boy, "Hi! I'm Jack. I am four years old and I go to Montessori school." And Jack walks us through his day at school. Children who go to Montessori will love recognising the familiar classroom environment. Children who are preparing to go to Montessori will love the bright and upbeat nature of the book as Jack and his friends have a fun filled day. The secret of this book? It explains Montessori in a classroom context better than any other resource I've found. Yes, this is a book for parents who might wonder what happens in Montessori. In a really subtle way it also helps us to understand why Montessori is so fulfilling for a child. Jack finishes his school day happy and content after much learning but also after circle time, choosing his own work, receiving a lesson from his teacher, working with a friend, group activities, preparing his own snack, cleaning and caring for his environment and working on problem solving and conflict resolution. This is an excellent book for parents wanting to know more about Montessori, children who are about to attend Montessori and so perfect for the school office/waiting room/education evening. This is also a great book for children who want to explain Montessori to others. For example a child could read it (or show it) to a friend, Grandparents or cousins if they wanted to show them how their school is different - especially if those Grandparents or cousins have never been to a Montessori school or haven't seen inside a Montessori classroom. A charming, well written and well illustrated book that fills the gap in the market for children's books about a day at (Montessori) school. Caspar has been in and out of Speech Therapy over the past three years. When he was a toddler we recognised his language wasn't as developed as other children. We had him tested privately and the results were ambiguous. When he turned three our school asked for him to be tested again so we had him tested in the public system. We've been told the public system has much more experience with children. It was determined he had some issues with articulation and begun therapy. It's difficult when experts determine your child has an issue when you don't really think there is one. All children develop differently. We could understand Caspar, it was only people we didn't know well that had trouble understanding him. His friends? I think they could understand him too. However it does require familiarisation with how he speaks. He has been in and out of therapy because it is taxing. When he started full days at school he was too tired to concentrate on therapy at the end of the day. We gave him terms off to adjust. Now we are at the point where he can't take any more time off. It's something he needs to be working on. His Speech Pathologist said today that his articulation is not as severe as many of the children she sees however it is a significant issue. Apparently it's an issue that won't go away on it's own. Caspar works with his (wonderful) Speech Pathologist on one sound at a time. The focus begins with the sound at the beginning of a word, the end of the word and then within the word. For work at home he is given pictures of objects (language cards) that he needs to say repetitively to practise the sounds. Repetitively. Repetitively doing something that is hard, boring and tiring. This week I asked his Speech Pathologist for ideas to make it fun. Doing therapy at home is so important but I'm not a fan of drilling things into children. At home we don't use bribes or incentives (as others have suggested as being good for getting through therapy). But we keep it short and as light hearted as possible. The suggestions we received were really useful and made me think of the Montessori concept of incorporating movement with learning. Playing hide and seek with his language cards (saying the word after finding each card), playing bingo or memory (saying the word after matching or turning over the card), posting the language cards (say the word and then post the card into a box) or incorporating them into games such as dice games (every time you get a six you say the word). Using a mirror and for some sounds a straw is useful and fun too. This isn't generic advice because I know there is great variation in therapy. Rather some recognition of a issue we are working with and how we are doing our best to get through something not so pleasant. We are also trialling Caspar having therapy at different times of the day, so he isn't so tired. This may mean some therapy during school hours but we are hoping it is worth it.